The Econo Mya QT is only 14 inches tall but it is more than enough to hold its own against the big boys. The shiny silver stem perfectly accents the ridge textured glass vase. The Econo Mya QT is a quality hookah that can easily be converted to a two-hose model with the help of a Mya stem adapter and comes complete with the revolutionary Auto Seal System that eliminates the need for flip caps and stoppers! 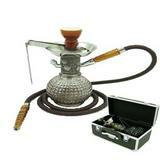 Multi Hose Capability This Econo Mya Hookah may be converted into a 2-Hose model which utilizes the auto-seal system by purchasing additional stem adapters. Click Here to view and purchase the required Mya stem adapter.